ES and FIFA will forever be locked in a head to head battle just like Android and Apple or Xbox and PlayStation. This year is no different, another year of supposedly better graphics and gameplay to bring us close to feeling what it’s like to play the beautiful game in the comfort of your living room. 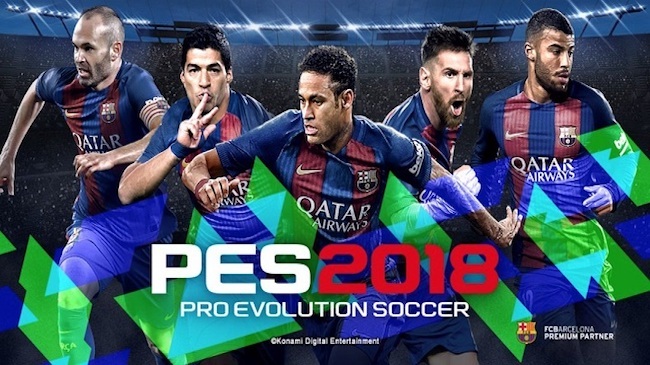 This year Konami have promised that the PC version will get more attention and will not just be a port like last year’s version. Both PES and FIFA have both pushed the boundaries on presentation and player animations, FIFA has the better presentation and graphics but PES is clearly starting to pay more attention and this year it feels as though Konami have made an extra effort on player models and menu presentation. However although there are improvements from last year, it still falls short when compared against its rival on presenting the beautiful game in a realistic way. Fans still look like cardboard cut outs, player models for players who have not made a deal with Konami to be in the game don’t look anywhere near the same quality. And the commentary from Peter Drury and Jim Beglin is still as awful as it was last year. On the pitch it is a different story. The passing and movement on the pitch is better than last year’s version, Konami have slowed down the game this year giving you more time and control on the ball. 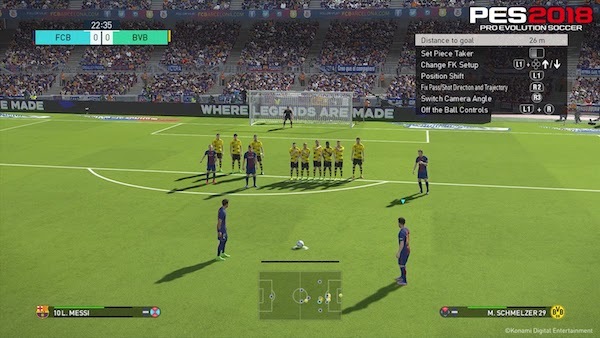 Pulling off a long range pass is even more satisfying this time around, and just encourages you to zip the ball around like Barcelona. 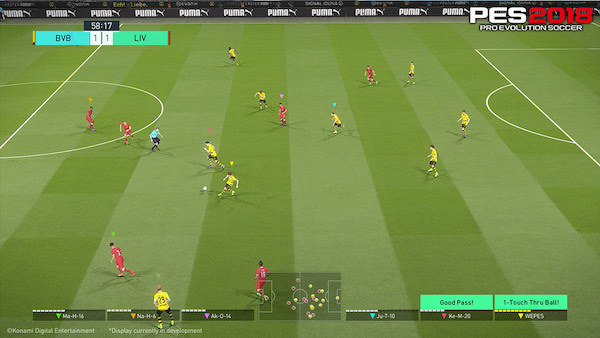 Players shield the ball and stumble past opponents more realistically this time as well adding to the realism rather than feeling as though you’re controlling cardboard cut outs of your favourite players. A major sticking point every year has been the lack of licenses for the big teams and leagues around the world. This alone has probably cost Konami thousands of fans switching from FIFA to PES but it is something that can be resolved on PS4 and PC by the PES community and a USB stick, so no more Man Red (Manchester United) and London FC (Chelsea) unless you’re on Xbox. While PES does well on the pitch its online modes have not been as good or as reliable as FIFA and it is actually a reason as to why I usually end up playing more FIFA than PES. Unfortunately it looks as though this year is no different. MyClub which is Konamis answer to FIFA Ultimate team is still not even close to challenging the hugely successful money making mode from FIFA. Konami have included a 3 vs 3 co-op online mode in which you and two friends or random people from the internet control a player each and attempt to get the victory. However if you aren’t able to find anyone then you are stuck with the AI. 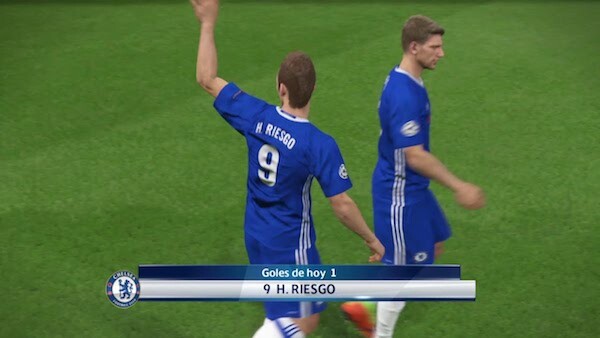 Offline modes are still the main reason PES fans return, especially Master league. With a new layout, better navigation and some new cut scenes there has been some improvement to presentation. However there are still outstanding issues with wages displayed yearly rather than weekly, unrealistic transfers and unrealistic budgets for the big teams. However it’s still the most fun you can have on PES, taking an unknown team from nothing to champions will never not be fun. Random Selection Mode is a new mode to PES, well it’s new if you don’t remember it being in Pro Evo 6 way back in 2006. If Konami are trying to bring something new to the table that FIFA don’t have then they seemed to have hit the nail on the head with this one. 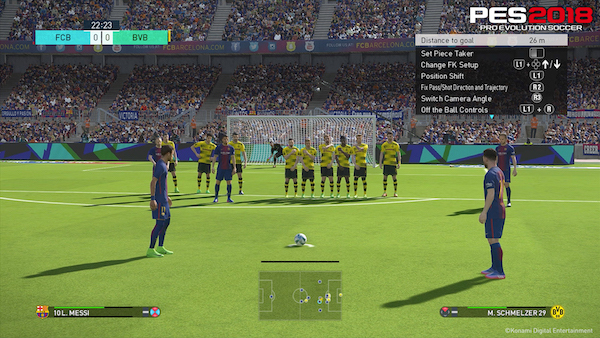 I don’t think you’ll see FIFA trying to compete with Konami on this mode. The mode is for local play only, you each get a squad of random players from a selection of leagues and countries you get to choose. You then attempt to compete to get the best players while trying to protect your own star players which your friends are allowed to draft and you don’t know who your friend has picked until the end of the draft. Honestly it doesn’t sound very appealing to me, usually when you have friends around you just want to get quick games with your favourite teams. I don’t see this being a popular addition and can see this being removed in next year’s version. I hope this isn’t a sign of Konami running out of ideas on how to compete with FIFA. Become a legend, a mode which allows you to control one player and grow his career is still as poor as ever, considering how much effort FIFA have put into The Journey and providing fans with a story mode to play through its really disappointing to see nothing being done with Become a Legend. If you had to choose between Become a Legend and The Journey I think there is really only one winner. And I still don’t understand why I have to double tap the bumper to ask for a pass, just let me press the pass button please! While on the pitch Konami are doing a great job they are still lacking in key areas. I am still disappointed in lack of effort put into Become a Legend mode and the inclusion of Random Selection doesn’t seem like something that will appeal to the majority of PES fans who would want more reliable online modes. However this year the PC version is as good if not better than the console version. I lost count the amount of times I’ve mentioned FIFA but like it or not PES will always be compared to FIFA and although the battle on the pitch is close, off the pitch PES needs to get its act together fast. Rating Summary: This is a soccer simulation game in which players control soccer teams from international leagues. Players can compete in a variety of modes (e.g., Training, UEFA Champions League, Master League) and improve their skills through practice shootouts and drills.